Our experienced, professional DJ turns up with a high-tech mixing desk and does LIVE MIXING (not just playing a compilation)! He has over 80,000 songs and can cater to any age group or musical tastes and he will consult with you before your event regarding any specific requirements. For a minimal extra, he can provide the music for the reception and for dining etc and will go on the perform the musical entertainments before, in the breaks, and after the sets by Funk‘N‘Soul. Your event will be enhanced with our professional DJ, as his system plugs right into ours. He has worked with us for many years and his choice of music and timing compliments our sets every time. Our lighting service can include a variety of contemporary lighting effects tailored specifically for your performance area or entire venue, setup by our in-house Stage Manager. We can provide a combination of low to medium level staging, which can accommodate the entire band and give them the right presence and viewing height for your audience. These services can be arranged at the booking stage and are completely optional. 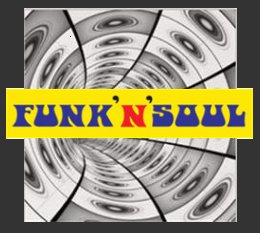 Hiring the ‘Funk ‘N’ Soul’ complete package is a great way to save money, time and stress at your event, avoiding the need for multiple sound systems, onsite technicians and additional performance acts!